Play for Mega Bucks at Butlers Bingo all weekend! Butlers Bingo is the place to be this weekend with not one but three big money games! Tonight you can take part in the Monthly Megapot game which is worth £1500. 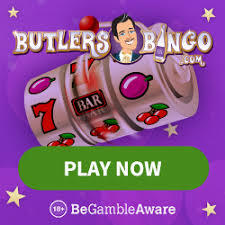 The Butler gave away 500 free bingo tickets into this game so make sure check your account to see if you've been awarded any of them. Tomorrow sees more money heading our way in the form of the Big £10K game. Tickets cost £1 for this bingo game and there's a humongous £10,000 guaranteed. The Butler has also put a ticket offer on this game so if you buy 6 tickets, you get 6 free. Very generous! On Sunday there's the Monthly £2000 game which plays at 10pm, leading up to that game are double jackpot games every hour from 8pm so you're in for a whole evening of juicy jackpots making Sunday a lot more fun! New players who sign up for an account at this bingo site will be treated to a free £10 bonus to try out the site. Once you have played through this free bonus money, you will be eligible for 200% bonus on your first deposit up to £100 plus 25% on your reloads.